Loving to visit Rose & Joe's Bakery for their breads and sweet things, I'm not too proud to admit that I've never yet tried their pizza. Very well known in foodie circles in Astoria, this pizza's reputation precedes itself in that it's supposed to be really classic and top notch. As I found myself near Ditmars on Saturday, I decided to stop in and try it. Rose & Joe's Sicilian Pizza - For those of you not familiar with the layout of Rose & Joe's Bakery, the pizza counter is situated all the way in the back. I like that the pies are made fresh and you can even get a sneak peek of the large industrial sized ovens they use in the back of the space. 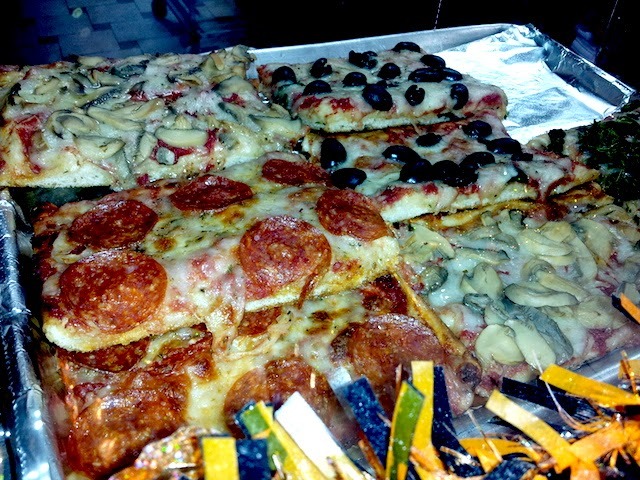 I chose the spinach Sicilian slice that you see above, but they have a lot of others you can choose from. 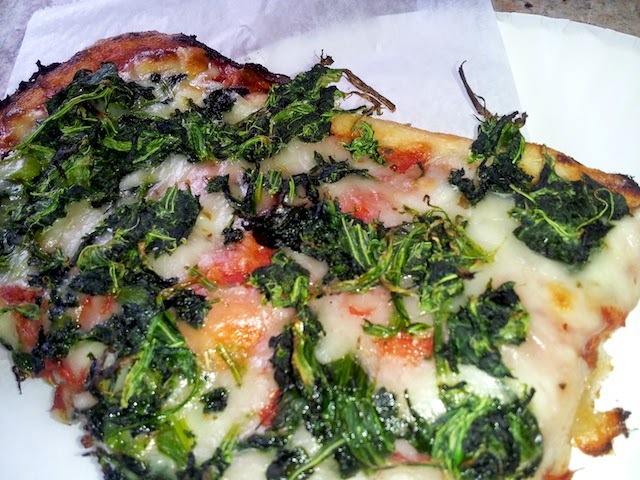 The crust was super thin, crunchy and the spinach was also a little crispy on the edges. I like the homemade tomato sauce, which wasn't too sharp and acidy and overall created nice flavor balance. The temperature of the pizza was the only thing I didn't love, as it wasn't hot enough. I think the flavors would've shined that much more if it was a few degrees warmer and in retrospect, I should've asked them to heat it up longer. Since this is still a somewhat undiscovered feature of the bakery (only true locals know about it), I got in and out of there in about 10 minutes. Eating my pizza in the shop at the front counter was nice, as I got to watch the busy goings-on of 31st street while I devoured. Costs are wallet friendly at just $3.25 per slice.